The story of Derelegyhaz, a town in southeastern Hungary, is one of the earliest and most inspiring examples of how EU Funds can develop and modernise village infrastructure. With the local municipality, EU-funded developments played a major role in recent years in enabling energy independence and self-sufficiency in the village and have revived the once-deteriorating town. In 2008, the local municipality started planning EU investments with the involvement of the local NGO association, farmers and entrepreneurs, relying on both European Regional Development Funds and Cohesion Funds as integral funding for their ideas to improve the community. One of the key elements of this success is the wide range of cooperation that allowed the locals to take part in making their homes more liveable. First, the centre of the village was renovated. Since there was no public lighting at that time, a solar lighting system was installed to switch to renewables. These street lamps are also connected directly to the grid, so the charging level of the battery can determine where the electricity comes from: the solar panel of the lamp or the grid. The city’s drainage for rainwater also received an upgrade and in small quantities can be recycled locally. In addition, the community house received energy efficiency upgrades in 2011. Since then the building’s kitchen has been supplied with local produce, which means that local farmers have some source of income and also locally grown foods are promoted among the residents. The local school also modernised its heating system, replacing the outdated version with an energy-efficient one that included flat radiators and a heat-regulating. In summer 2018, an efficient biomass boiler (including a woodchip chopper and storage tank) was installed in the school. The woodchips are sourced from local wood waste and plumage from the four hectares of poplar trees that grow nearby and according to sustainability principles. The poplar forest is irrigated by water from the village’s own sewage disposal and purification equipment, which also was funded by the EU. This system and the forests are managed by public benefit workers hired by the municipality, which improves local employment in the process. Further plans include installing biomass boilers for the kindergarten and the community house. Located in the sunniest part of Hungary, Derelegyhaz has huge potential for solar power. Since 2013, the community house and three other public institutions (the kindergarten, health centre and the mayor’s office) received energy from solar panels. Between 2010 and 2011, bicycle lanes were installed, some of which also rely on solar lighting. These lanes also connect the the nearby ecotourism park of Kéktó, which has been a boon for local tourism. 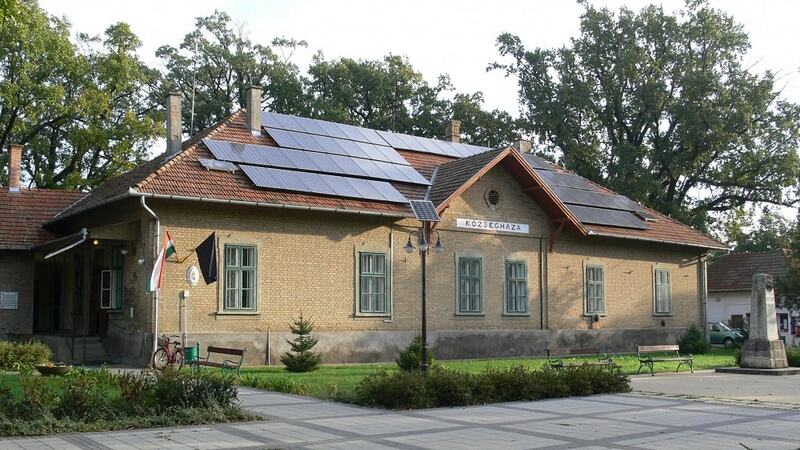 The municipality also plans a community-owned photovoltaic power plant, in cooperation with the Bankwatch member NSC-Friends of the Earth Hungary (MTVSZ). All of these investments would have been impossible without various forms of EU rural and development grants. According to Péter Ponicsán, chairman of the Association for Derekegyház, the key to developing a similar-sized town with EU Funds is “to have a professional team behind the grant writer, who can operate the designed system in practice and ensure a long-term sustainability of the programs, involving the locals.” In the case of Derekegyház, he found these helpers and entrepreneurs. The NGO is active in building the local community, with information days on energy awareness and other sustainable living-themed topics, forums and festivals. No wonder the village is thriving, as young families have settled here and former residents are returning. As a result of its energy and other initiatives, Derekegyház receive the Climate Star Award of the Hungarian Climate Alliance in 2013, and a year later the European Climate Star Award, for its decade of sustainable moves.